Sometimes faculty have the desire to reorder Tegrity course recordings to support easy access for students. Course recordings can be sorted using two different approaches which are described below. You can sort to reorder of the recordings in a Tegrity course. STEP 1: When you are in a Tegrity course, click the “Sort By” drop-down and select the sort order desired. STEP 2: Select to sort by Title, Date, or Duration. STEP 3: The sort order selected takes effect immediately. STEP 4: The new sort order is not permanent and is only for the current session. You can also edit the recording properties to change the date which will shift the order of recordings. STEP 1: Check the box for the recording you wish to edit. STEP 2: Select “Recording Tasks” and then select “Edit Recording Properties” from the menu options. 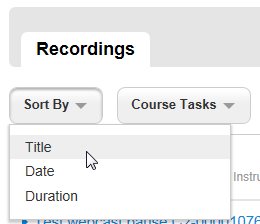 STEP 3: Change the date to a new date based on the order you wish the recording to appear in the course list. STEP 4: Click "Save" to apply the changes to your course. Refresh the screen (F5 on a PC) to review the order of recordings.